Almost everyone has a favorite Chair which is in need of a little care and attention , the most wonderfull thing about old furniture is that even after a long life they can usualy be brought back into service with a little bit of tender loving care and a good aplication of some polish or a little paint. You do not need a lot of expencive tools, and the materials are simple and very satisfying to work with , although there may be a little effort and practice involved the end result is well worth the time and the patience. We Suggest that you start with a simple small project for your first clas, a drop in seat,stool, dining chair, or a simple bedroom chair. If you are going out to choose a chair for your first project try to avoid ones with loose joints this means one with wobbly legs and loose back rails , although all these problems can be fixed on a valuable chair, it can often be complicated and expencive to repair them correctly. 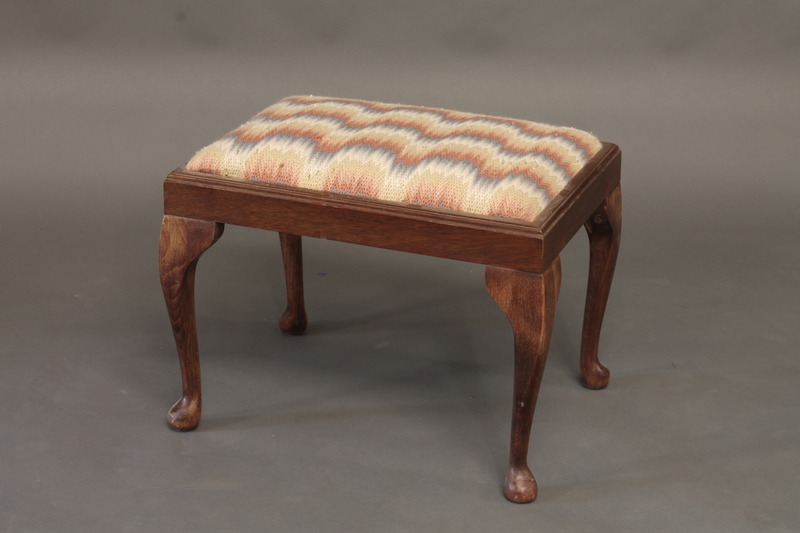 It is worth remembering that if one is putting in all the effort in to the upholstery work on the chair, it is better to chose one that is in reasonable condition. Once you have tried out the basic techniques, you will feel a little more confident to go on to choosing larger and more complicated projects. If you have a family favorite that you would like to restore, please feel free to come in and discuss it with us, if not you can look at the examples we have in the workshop. In the first lesson we will discuss the different kinds of upholstery and the materials used and the problems one is likely to encounter, so it is best not to buy anything until you are ready to go on to the second lesson. We will suply all the materials nececary to build up the chair and we also have a wide sellection of fabric books from which you can order good quality top cloths and braids to finish your project. You may already have some cloth that you wish to use but before purchasing cloth it is advisable to check with the tutor that it is suitable for the job in hand. Tools, braid and other materials can also be ordered through the workshop for any future projects. Introductory Classes are a good place for the beginner to learn some basic techniques. This four week class begins with a Talk and Demonstration, where we will cover the basic principles and materials involved, and discuss choosing your first Project . The following three lessons will give an oppertunity to get to grips with your first peice. We suggest that you begin with a simple dropin seat , or a lightly over stuffed dining or bedroom chair once you have got used to the basics you will find it easier to assess the work involved in a prospective project before you decide to purchase the frame or decide which materials you wish to work with. Basic materials , webbing stuffing and hesian will be provided for your first project, and there will be an oppertunity to order further materials and top cloth of your choosing, if you need further time to finish your project you can book extra workshop time at a nominal cost . Evening Classes also available by appointment .